In October the IPCC published its special report on 1.5° C global warming. Drawing on the evidence of around 3,500 papers, the report stated that the expected 1.5° C increase could cause very disruptive climate impacts at some point between 2030 and 2050 with the potential for unstoppable (‘runaway’) global warming beyond that point. The report further stated that greenhouse gas emissions will need to fall to half their current levels by 2030 if we are to have any chance of avoiding this potential catastrophe: dramatic events will occur as a result of these climate changes - events that are not limited to changes in weather patterns - and governments will need to make difficult choices in order to protect populations. Politicians at the COP24 Summit this week argued over whether they should “welcome” the report or “take note of” it but while they tinkered with the wording informed observers pointed out that, alarming as the IPCC report is, it may actually be too optimistic. On the 5th December scientists at Texas A&M University and the University of California, San Diego, published a paper in Nature which suggests that global warming is accelerating and that at some point between 2025 and 2030 the Earth’s temperature will reach 1.5°C higher than it was before we began burning coal to fuel the Industrial Revolution. This is double the rate of temperature increase considered in the IPCC report. Professor Nick Cowern of Newcastle University, in a paper published last month in Earth System Dynamics suggested that the primary reason for the current acceleration in global warming is that the [otherwise obviously desirable] reduction in pollution from coal-fired power plants and other sources is allowing more sunlight to fall on the surface of the earth, where before more of it was reflected back into space by smoke particles. Something of a bitter twist in the climate change narrative. 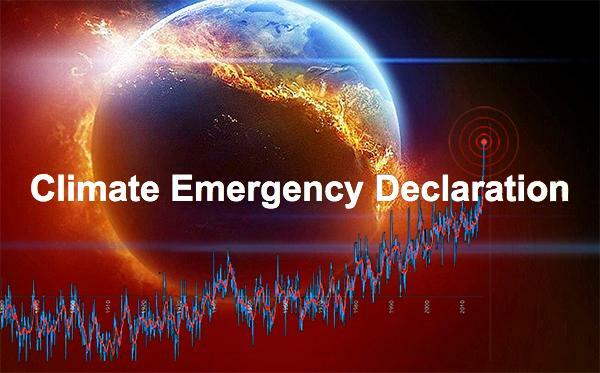 So the evidence suggests we face a climate emergency. Climate scientists, who have traditionally concentrated on trying to make accurate long-term predictions, will need to help governments and businesses to take action based on a better understanding of of near-term climate change and how it can be combated. We have to regard climate change as an immediate threat and develop strategies to cut the rate of temperature increase as soon as possible. Reducing emissions of methane and non-methane hydrocarbons by the oil and gas industry and from agriculture and waste along with a huge expansion in power generation from renewable sources and a switch to electric vehicles must be our priorities. We have to mobilise ‘green’ industry as dramatically as we did armaments production in the late 1930s with the approach of the Second World War. Governments, academia, industry and big investors must work together to deal with this existential threat.